Doc just arrived from the Bolton Kennel at the Sanford Orlando Race Track. He was a very slow guy that only has one race listed and he finished last. He wasn't much better in his previous schooling races. His trainers say that he would be a good candidate for dog sports because he is injury free and just not quite fast enough for the professional track. He is very young and won't turn 2 until May 27th. His sire is the famous Cayman Went and his dam is D's Overthemoon. Doc is a big brindle guy that raced at 80lbs. Doc was a little overwhelmed at first when he first arrived but is already warming up in his foster home and becoming a happy goofy guy. 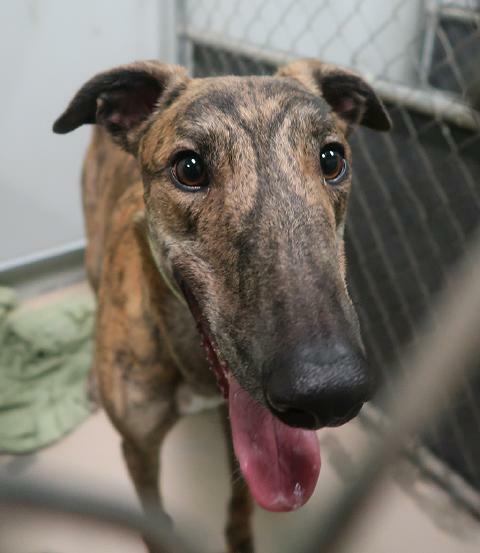 He seemed a little timid at first and would stay just out of reach in the yard by himself but would come right up if another greyhound was getting petted. He needs a little work on leash because he tried to backup or bolt if something scared him. He is very quiet in his crate and is being fostered in a townhouse so should be a good choice for apartment or townhouse living.